Lake Skorradalsvatn has an area of 14,7 km². It is 16 km long and mostly 1 km wide. Its greatest depth is 48 m and its surface lies 57 m above sea level. The river Fitjaa feeds it and its discharge is Andakilsa. When the hydroelectric power station was built on it, the lake surface rose as a result of the construction of the dam. Lake char is abundant, but most of it small (1 pound). 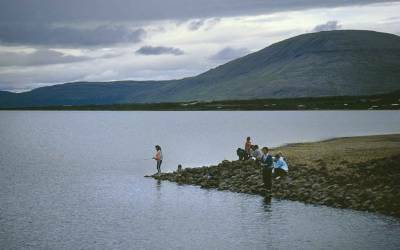 Every summer a few very large lake chars (17 pounds) and brown trout (14 pounds) are caught. They are mostly caught in the deepest areas from boats with spinners. The bait: Fly, spoon and worm. The distance from the capital is about 92 km (somewhat shorter by the Whale Bay tunnel).